Although most cabinet include a manual with instructions, showing how to assemble your cabinet, it isn’t an easy job and sometimes it could cause you problems. Improperly assembled cabinets aren’t steady and can easily fall down and collapse when loaded. To avoid this use our professional cabinet assembly services and you can receive properly put together and mounted cabinets. Our cabinet assembley service is only one of the professional handyman services offered by HomeMates in London and Greater London. You can call us on 020 3745 4377 or email us at info@homemates.co.uk. 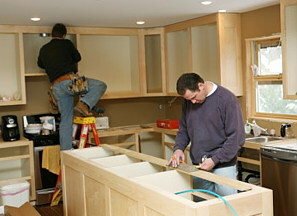 The process of assembling cabinets, whether they are one doored and plain or have multiple doors and are more elaborate, is similar. You can have well assembled cabinets, which can be filled with many items without the threat of collapsing, if you use out cabinet assembly services.